I was recently digging through the archives of the Press & Dakotan doing some research when I came across a curious story involving an old corpse that had apparently been planted on Gavins Point Dam. Yes, you read that right. I thought maybe you’d share my curiosity about the story. The first story appeared Friday, April 21, 1967. On Thursday, a badly decomposed body was found on the face of Gavins Point Dam, where it had washed up from Lewis and Clark Lake. Father Dominic Laven, the chaplain at Sacred Heart Hospital, noticed the body on the shore and called the Yankton Police Department at 5:15 p.m. According to the story, Yankton County authorities were seeking the identity of the corpse. County Coroner Dr. Max Reade said the body was too decomposed to make any easy identification. He said it did not appear to be the body of a Pilger, Neb., banker who drowned in the lake near Niobrara, Neb., while duck hunting in 1965. Nor did it appear to be a man who had been missing since 1955. The Press & Dakotan published a follow-up on Tuesday, April 25. It appeared under the headline “Body Found At Lake Thursday Called “Hoax”. Dr. Reade had concluded the body wasn’t a drowning victim. He determined it was a male of about 35 years of age who had been dead for 50-60 years, or possibly even longer. Clothing on the body was much newer, leading Reade to believe it had been placed in the water along the shore as part of a hoax. It had only been in the water a matter of months, he told the newspaper. The corpse was mummified and calcified, and Reade said it didn’t appear to have had any formal burial. Instead, he thought it had been underground or in a shallow grave for a considerable length of time. “The sock found on one foot of the torso was a well-preserved stretch sock of recent manufacture,” the article stated. “The piece of belt found also was of recent date. One-fourth of a pair of trousers — the back part of the left leg — was found on the right leg of the torso. Reade said authorities became suspicious when they realized the clothing and body could not possibly go together. “The conclusion is that the body appears to have been placed on the beach and articles placed on the torso for unknown reasons,” he stated. Sheriff Jeff Scott and Reade said that if the billfold could be found, it could help determine the perpetrator of the hoax. Reade said no further attempts were being planned to determine the identity of the body. 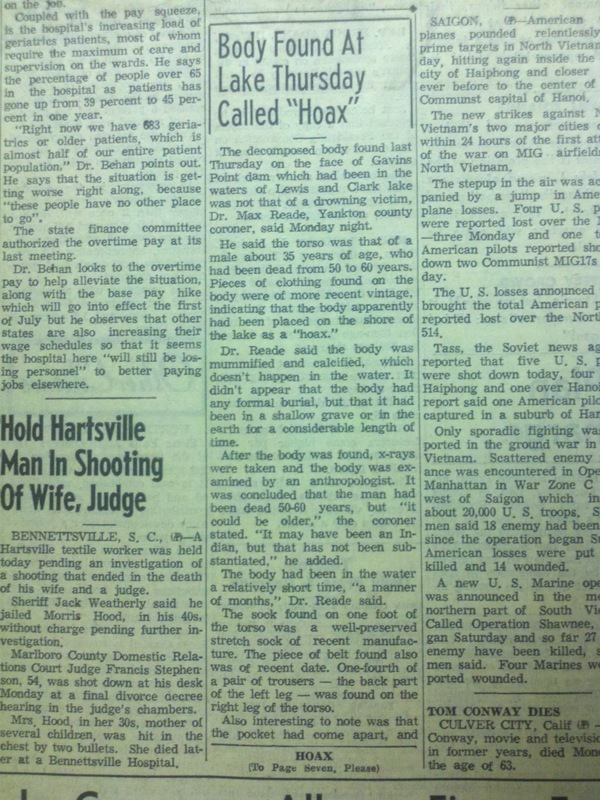 This is the actual Press & Dakotan story about the corpse found on the face of Gavins Point Dam in 1967. The story certainly raises a lot of questions — the motive being number one on my list. I have no idea if there were any more developments in the case. I checked a few more editions for an update and saw none. Perhaps it is a forgotten mystery. But if anyone recalls the case and has more information, I’d be interested to know about it. After my coverage of Sr. Simone Campbell a couple weeks ago, I got an unexpected phone call. An editor with the National Catholic Reporter wanted to know if I would do freelance work for them and retool the story on her speech at Mount Marty College. Joshua J. McElwee and the editors at the National Catholic Reporter did a good job of helping me widen the scope of the story to address a much larger geographical audience. On Oct. 1, the Affordable Care Act, aka Obamacare, crosses an important benchmark, as the state health insurance exchanges begin operating. These state insurance exchanges will function as open marketplaces where individuals can buy private health insurance under the act. The exchanges will centralize purchasing: Once a person fills out an application, he or she can see all of the plans available in that state as well as any subsidies or government programs for which they might qualify. Certainly religious and civic groups should step up to the plate and help educate the public, especially the poor and working poor, about how the Affordable Care Act can work to improve their lives. Catholics in particular must put aside the issue of contraception and stump for this valuable social policy. Once people realize that their premiums really are not going up as fast as they were, once individuals previously unable to afford insurance can find it, and once the working poor receive just subsidies to purchase what is a basic human right, the implementation will go smoothly. I’m glad I got to be involved with something outside the normal realm of my daily life. I have Mount Marty College, Sr. Campbell and the National Catholic Reporter to thank for that. You’ve read about Boo Radley. But have you read about The Boo Radleys? The Boo Radleys were British. They were bold. They were beautiful. They were Beatlesque in all the right ways. But, there is a good chance you’ve never heard of them (unless you own the “So I Married an Axe Murderer” soundtrack and heard their cover of “There She Goes”). BECAUSE THEY ARE THE MOST OVERLOOKED BAND OF THE 1990s. It’s a fact that has been getting me down for many years, but the feeling resurfaced in the last week as I’ve immersed myself in the Boo Radleys’ catalog. It’s so rich and warm. The band members are like good friends I’ve never met. That’s why I want you to meet them, too. The Boo Radleys released several things in the early 90s, but they really exploded as a talent to be reckoned with on 1993’s “Giant Steps,” which several British music magazines placed among their top albums of the year. In 1995, with Britpop in full swing, The Boo Radleys did their own version of pop. “Wake Up, Boo” with its horns and exuberance was a clarion call to raise any heart out of the doldrums. The straw that broke Boo’s back was “Kingsize,” another album that I loved immensely. The band wasn’t feeling the magic any more by 1999 and broke up after making the album in 1998. The band members went on to other projects, and The Boo Radleys have not reunited like some of their peers — Suede and Blur, for example. We can only imagine what they would have gone on to achieve together. If you’ve listened to the above tracks, you’ve gathered that The Boo Radleys had a very melodic side that they liked to pair with dissonance, dub and whatever else they could conjure up in the studio. I’m hard pressed to think of any other band who did what they did so consistently and successfully and yet was hardly recognized for it. As much as I love a band like Olivia Tremor Control, they did not achieve the heights of musical genius as often as The Boo Radleys (and I do really love Olivia Tremor Control, OTC fans!). The Boo Radleys were the most overlooked and under appreciated band of the 1990s. They deserve better. It starts here. 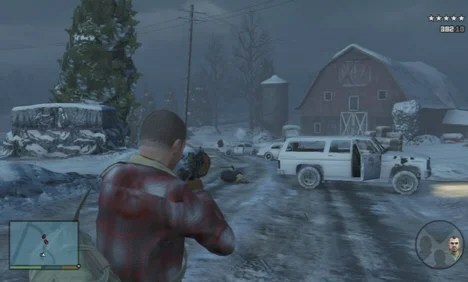 A screenshot of North Yankton in the game “Grand Theft Auto V” taken from ign.com. Yankton has a place in the new game “Grand Theft Auto V,” which has had sales in excess of $1 billion within days. And it’s not really based on the Yankton we know, per se, but certainly evokes thoughts of the actual place with the snowy rural landscape. I came across this fact thanks to the sleuthing of some of my colleagues. Funnily enough, I own the game, but haven’t had a chance to play it yet. Considering that the game has been criticized (as have past editions) of glorifying violence and drugs, as well as demeaning women, the appearance of Yankton’s name in this cultural phenomenon may not necessarily be something to celebrate. North Yankton is a state featured in Grand Theft Auto V’s prologue and Bury the Hatchet missions. The state is based on North Dakota. Very little is known about the state, but the small town of Ludendorff is located there. In GTA V, Ludendorff is covered in snow. I’m sure you want me to go on, but I’ll spare you. If you’d like to see how North Yankton is portrayed in “Grand Theft Auto V” and where the inspiration for the taglines come from, check out the clip below. I should warn you, it contains vulgar language and violence. Most Americans have a higher opinion of cockroaches than Congress. Maybe it’s because they aren’t listening to a majority of Americans. That kind of situation can create a lot of anxiety in a democratic system. A study in Political Research Quarterly found that, overall, members of the U.S. Senate represent their wealthiest constituents, and those in the lower classes are neglected. “The fact that lower income groups seem to be ignored by elected officials, although not a new finding, remains a troubling observation in American politics,” Thomas J. Hayes of Trinity University wrote in his study. Read more about his study here. Although Sister Simone Campbell didn’t talk specifically about this (and previous research in this vein) during her lecture, “Health Care and the Poor,” at Mount Marty College Thursday, she did talk about the problems it creates. At the beginning of her lecture, Campbell called on volunteers to create a human bar graph showing the audience how far the incomes of the top 5 percent of earners outstripped all others between 1979 and 2009. Those on the bottom of the income ladder actually saw their incomes decline. “For me, it helps explain why it’s difficult for folks who are (in the top 5 percent of the income ladder) to understand the struggle (of those at the bottom),” Campbell said. “Because what happens is, not only are they economically removed, but at (the top of the income ladder) they can afford gated communities, private police, private schools, private medical care. Members of Congress are in those top income levels and don’t understand what is going on at the bottom, Campbell said. “That’s why democracy is so important, and that we each use our own voice to speak our truth and be witnesses to each other,” she stated. It’s tempting to think of income and wealth distribution (two different things, let’s remember) as merely economic issues. However, they are much more than that. The accumulation of large amounts of money into relatively few hands rips at the fabric of society — of democracy. It makes it so that people can’t relate to one another. Researchers have been investigating many aspects of this reality. Here is but one study where Berkeley scientists found that the affluent are more isolated and less generous than the poor. In other experiments, the researchers found evidence that lower-class participants’ greater tendency to perform kind, helpful—or “pro-social”—behavior could be explained by their greater concern for egalitarian values and the well-being of other people, and their stronger feelings of compassion for others. However, the researchers also found that when they induced feelings of compassion in upper class participants, those people showed just as much pro-social behavior as lower-class participants. This suggests to the researchers that the rich aren’t as generous as the poor because they don’t typically feel as much compassion for others. Piff and his colleagues argue that the poor may feel more compassion because they are more connected to those around them, psychologically and socially. They are more dependent on other people to get by, for instance, and previous research has found that, perhaps as a result of that dependency, they display more empathy and are more attuned to other people’s body language than the rich. On the flip side, as people attain higher status, their ability to take others’ perspectives is diminished. We’ve seen how Congress is content to let sequestration cut funding to Head Start, Meals on Wheels and other low-income assistance programs. However, when it began to affect lines at the airport and therefore Congress members and their business class friends, a solution was quickly found. If Americans in the middle and lower classes (as well as the empathetic members of the upper classes) are content to watch the economic gulf widen, we can expect this societal breakdown to continue. I think the first solution is to follow Campbell’s advice. Somehow, the concerns of the lower classes must be communicated to the rich. Wealth tends to make people retreat into materialism, research shows. However, if you expose them to other viewpoints and realities, they are just as capable of empathy as anyone else. We mustn’t allow them to retreat into their castles, so to speak. The second track we must follow is pursuing policies that ensure that money is better distributed throughout society. Minimum wage laws, CEO pay caps and progressive taxation are some examples of policies that assist such an effort. We are encouraged to believe the economy is something divine and best left to its own devices. It’s a mythos reinforced by those who benefit from the current structure and from those who have given up on government. But it’s not an invisible hand that moves money from one place to another, it’s the hands — and policies created by — people that determine its flow. At the end of the day, it’s up to us to make sure the economy is structured in a way that best serves all and not just the few. An economic system must also be a just system. Currently, it is not, and it’s hurting everyone, from the rich to the poor, in our nation and beyond. Eric Idle and Robbie Coltrane were “Nuns on the Run” in the 1990 film. That movie, while close to my heart, has nothing to do with this blog. Move along. Nothing to see here. It’s hard covering a nun on the run. The nun wasn’t running. I was. I feel the need to point this out because I covered Sr. Simone Campbell’s “Health Care and the Poor” lecture at Mount Marty College Thursday. She spent a, um, healthy portion of time laying out the vast income disparity that exists in the United States and the problems that creates. Readers of this blog know the subject is one that I feel is very important, so I was glad Campbell stressed its relevance to the health care issue. All in all, it was an inspiring speech that I may talk more about on this page later. However, I first wanted to offer some explanation about how I covered the event in case you care to know and perhaps prevent you from filing any complaints. However, before Campbell’s speech, I managed to put together some basic background on her and the controversy surrounding her visit because I knew I’d need it for the story. The lecture began at 7:30 p.m. and by the time questions wrapped up, it was after 9. I quickly said some farewells and headed back to the office. It was already 9:30, which is my soft deadline to finish a story. By 10, I can expect the editor to be breathing down my neck asking when I’ll get done. By 10:10, he’s telling me I have to end it. No more. Done. That’s all, folks! The first thing I did was find the stars in my notes marking the times of key quotes so I could go back and listen to them. I’ve always believed one of the keys to my modest success in journalism is that I don’t trust my memory (or my scribbles) under any but the most dire circumstances. No matter how mundane the subject, I always record my source and transcribe my notes from the recording. Memory is not to be trusted! Complicating the transcription process Thursday was a problem I knew I’d have from experience: The sound in an auditorium, without having a speaker right next to me where I can place the recorder, is murky. It’s a struggle to make out everything that is being said. By the time I had transcribed what I could of the key quotes and gathered some other information together, it was 9:55. Time was short to actually write this thing! I started putting the pieces together. I knew the plea to support the expansion of Medicaid and the criticism of the governor had to be on top. Why? Because it was a call to action and quite an accusation. Campbell said Gov. Dennis Daugaard hadn’t expanded Medicaid because of party politics. It’s a pre-emptive strike of sorts. I’m hoping that by explaining the time constraints I was under, you’ll understand why I didn’t include your favorite quote, or that great point or that interesting question — and forgive me. It’s the same problem I run into occasionally when covering long night meetings or writing a complicated story that I just can’t finish, but I particularly felt the squeeze of time and the limitations it imposed on the Campbell story Thursday. My blood pressure is just now returning to normal (“now” being when I wrote this last night). Covering a nun on the run is hard work. You know I watch a lot of films. A LOT of films. But it’s only every once in a while that I come across a film that stops me in my tracks and causes rainbows and unicorns to shoot out of my eyes in utter amazement. Well, that happened to me twice in the last week. I feel pretty darn lucky. Reygadas is one of those rare directors who gives every image a kind of spiritual weight that is hard to put into words. It’s magical in that way. OK, before you rent this (because it’s now available on DVD), let me give you the heads up so you don’t get mad at me. This probably isn’t the film you’re going to make popcorn for on family night. It’s not particularly concerned about a narrative (as far as I could gather), and it has some truly strange things take place. If you’re up for that kind of experience, you are in for a treat. But if not, to each their own! The next film I saw was the Lithuanian sci-fi masterpiece “Vanishing Waves.” It’s an intoxicating visual experience. This movie has a more concrete narrative than “Post Tenebras Lux,” but you may get so caught up in the cinematography and sound that you won’t much care if you are into the story. I also want to mention “Prince Avalanche.” I’ve long been a fan of director David Gordon Green — ever since he emerged with “George Washington.” He made a great run of small, powerful indie films before doing “Pineapple Express” and some other more Hollywood fare. This film is a return to those indie roots. It’s not the visual spectacle that the aforementioned films are, but I found the story and characters resonated long after the credits (which is why I watched it twice!). You can currently catch this film on VOD.